The tick of a clock reminds us how Mathematics is important and integral part of our lives. Mathematics has played a vital role in building modern civilization and Shri Ramanujan, a genius Mathematician has made exemplary contribution towards the same. For class I – V, the topics were simple calculation with 4 rounds each with 5 questions. The students participated in the relay in groups of 4 students each. For Class VI- VII, the topics were simple equations, ratios, profit and loss questions. The students participated with full enthusiasm and helped in building their abilities to solve questions in less amount of time. Classes VI- VIII participated in this event by solving puzzles on mathematics. Class VI was given puzzles to solve with few word problems. Classes VII – VIII were presented tougher questions. Like, If there are 8 identical coins in which 7 coins weigh 1 gm and 1 coin weighs 2 gm, how are they going to identify the heavier coin if they can be weighed only twice. How many different cubes can they paint with 4 given colors? Few students came up with interesting answers while others struggled to get the answers. Students were given sheets of Sudoku and Kakuro to solve individually. Junior classes were given easier versions while the seniors handled the tough ones. Few Students were given games like Loop the Loop, Multiplication Kakuro. It was indeed a delight to see the little minds work with such enthusiasm. 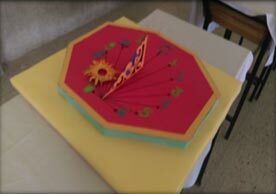 Students chose their topics and came up with beautiful models on mathematics. Junior students made use of tangrams and came up with cubes using Origamy. Students made model on tessellations in architecture, trigonometric calculator, model on maximizing the utilization of parking area as well as came with good solutions for parking problems. Students made a model on open stadium to maximize the capacity of the stadium, illusion models. Demonstrations using volume of solids. Students were asked to come up with few tricks of Vedic Mathematics to discuss with their peers in the class. And then they were given a chance to demonstrate the tricks in the class. Students of Class VIII were presented with Pascal Triangle to ease up their concept of identities on Binomials. Class X students came up with projects on application of Mathematics in daily life like architecture, clothing, nature, cosmetics, science etc. Class XI students were asked to read and write a review for the book “ An Apology by a Mathematician” by G.H. Hardy who gave the chance to Ramanujan to show his work to the world.